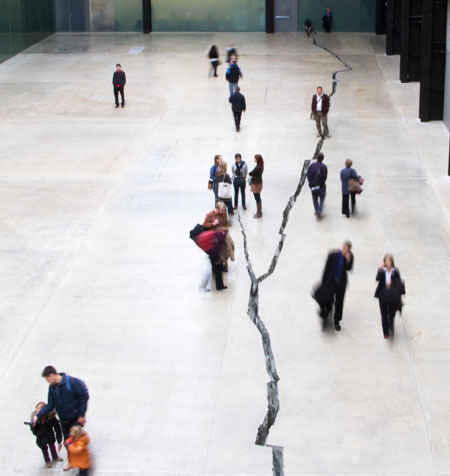 I liked Doris Salcedo’s Shibboleth (above) at the Tate Modern a few few years ago. Since I couldn’t afford to buy it I decided to get my own with the help of a poorly maintained council owned tree. …..once upon a time, about two and a half years ago, we returned from a very pleasant holiday in Corfu. A few hours after our return our next door neighbour knocked to enquire whether we had any cracks in the party wall. We replied that no, to our knowledge we did not. He persuaded us to check and sure enough, behind the TV there was indeed the beginnings of a mini-Shibboleth. Moving more furniture revealed further cracks along the party wall and indeed on the front bay. 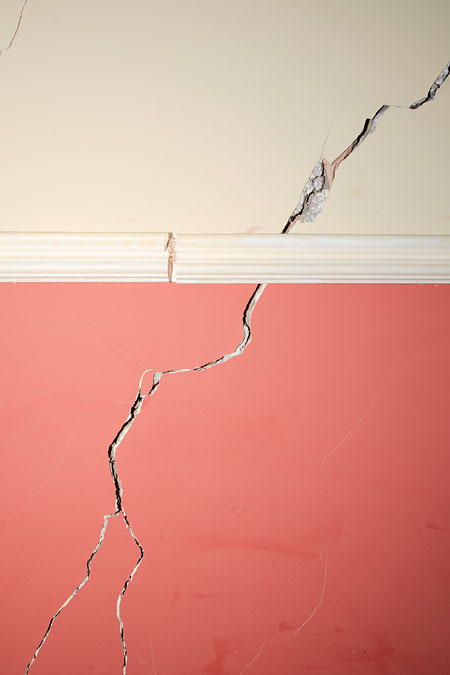 The cracking pattern was found to continue upstairs where it was even better hidden, being at the back of our wardrobe. “Arse,” and indeed, “Feck!” but strangely not “Drink!” were amongst the words we exclaimed. It was clearly, to us at first, an issue of subsidence rather than an artistic statement and hence we agreed with our neighbour that we’d both contact our insurers the next day. The agent contracted by our insurers was on the property within a few days and after an inspection of less than hour concurred that this was indeed subsidence and that it would be covered by our household insurance policy. So, good news in that it was covered, less good in that, in common with most buildings insurance policies it carried an excess of £1,000 (still somewhat cheaper than the original Shibboleth!) The most likely cause was thought to be the council controlled tree on the pavement and in an attempt to prove this holes were dug and root samples taken for DNA analysis. The insurers remained convinced that this tree was the cause with the council being less sure. Eventually, however, and thanks mainly to our neighbour constantly badgering everyone involved, but still 13 months after the initial sighting of the cracks the trees (there was a second affecting the neighbour’s property) were removed. In the meantime our cracks were being monitored on a monthly basis to check the movement and indeed, as predicted, once the trees had been removed the crack did begin to close up a bit. The neighbour’s house was repaired and he moved out sometime last year whilst we awaited the start of repairs. Our insurers wanted to confirm that movement had ceased before starting repairs which made sense but even so it was only this week that they finally began. The the plan was that on Monday a removal firm would come and take some of our furniture to a storage depot. On Tuesday a specialist asbestos removal firm would take down the sitting room ceiling (the artex had been found to contain asbestos, apparently quite common until 20 years ago). Then on Wednesday the main contractors would begin the repair work. Yeah, right. Three different contractors all working for a fourth would be able to deliver on time. Well, they did……and as I type poor little Shibby 2 is almost certainly an art of the past just like its inspirational mum at the Tate Modern. …sprouts from poor Nat’s shoulders during Aronofsky’s latest tale of suffering for one’s art. And that’s the least of her troubles! Our troubles began when I went to book tickets (at 11am) for the 6pm showing only to find all the “Premier” seats (ie: those that aren’t too close or too far away from the screen for the optimum cinematic experience) were booked. Actually half of them had just been vandalised and so were out of use, I can’t believe they still haven’t fixed them, must be costing them a small fortune. Anyway, I opted for the furthest back of the standard seats, three rows from the front which is usually fine for anything but really high octane explosion filled fare. The obligatory half hour of adverts and trailers were certainly totally viewable so maybe, I thought, the diva drama would be too. Well, it started very grainily or, maybe, noisily though that perhaps gives one the wrong impression. If I say noise here, I mean, digital noise on the picture not loud sound. Mrs.P reckoned it was supposed to be like that for artistic purposes but if that was the case then I’d strongly advise against shelling out extra for the Blue-Ray as it will be just as grainy/noisy as the Betamax (Betamax release date not yet confirmed). Alternatively, maybe it was just that we don’t usually sit this close to the screen. The next problem revolves (and shakes) around cinematographer Matthew Libatiquer seeming not to know about Steadicams, tripods or even just standing still whilst filming FFS. I’m sure this too is part of the artistic process but I just found it confusing and Mrs P said it made her feel sick and closed her eyes for much of the film as a result (and she really wanted to see it!). Again maybe this was accentuated by being close to the screen. The broken legs bit I actually liked, indeed I laughed out loud (it was supposed to be funny wasn’t it?). This is great progress for me as for several years after breaking my leg I couldn’t watch anything involving broken limbs at all. If this is starting to all sound a bit negative then maybe that’s just because it’s really easy to criticise anything so obviously stylised and personally I found it a bit obviously over the top. However, overall I did enjoy it and most of the performances were very good indeed. Except poor Natalie Portman. She didn’t convince me for a single minute as anything other than the silly, one dimensional white swan. Her barking* black swan was just totally unbelievable (watch her get the Oscar). Ah well, I’m afraid “Leon” remains her only good performance for me…..but that was very good indeed so we’ll let her off. I do look forward to seeing Black Swan on DVD though, it’ll be interesting to see just how much of my antipathy was from sitting closer than we normally would. Next? Not sure, we’ve already seen “The King’s Speech” which was very good indeed (which I wasn’t really expecting). “Brighton Rock” (based on the Sheer Heart Attack opener I assume) or “The Fighter” I think…. London Nature Photo Blog: is working again....nobody told me it wasn't so who knows how long it's been broken? And the thumbnail below is of the Perseid meteor shower, not another error or just a black rectangle. High quality, fresh cut flowers soon to be available from Orchard Farm Flowers in East Sussex.